As a program that works with student bodies we are constantly growing and changing with each passing academic year, however there are some constant standards, concerns, and needs that we deal with. Please look over the following information on our program and fill out the form at the bottom of the page with your questions and comments. As a program that specializes in working with student groups and young people we must maintain very high safety standards to satisfy the requirements and expectations of the participating Universities. Our officers participate in First Aid and CPR training and we only participate in events that have EMS services on site. We require a step by step weapons familiarization class which is often taught right at the events or on training weekends based on the drill and exercises of the 1860's and with the utmost safety of the students in mind. 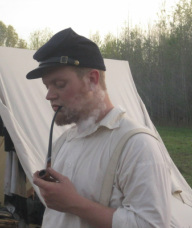 Our authenticity standards are that we expect every participant to make a real effort to living the life of a Civil War soldier while in the field. We sleep on the ground (with or without tents), cook over the fire, and mend our own equipment and clothes in camp. That being said we acknowledge the medical needs of our students and never place the event and authenticity before their safety. 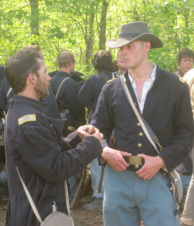 We do like to change our look (called an Impression) to fit the event we are participating in and have outfitted in different uniforms and equipment to fit the history of the event we are portraying. This is one of the fun aspects of the hobby as is the research the students put in to these events to discover the changes and correction we need to make for historical purposes. In fact it is not unusual for our unit to request unique and even odd impression for events if they are available. Every new semester we tirelessly scout out campuses that would enjoy this program. Our hope is that we can start a 4 -30 person unit on every campus depending on it's size. Our program focuses on the states of Arkansas, Oklahoma, Texas, and Louisiana with attention to the southern halves of Kansas and Missouri as well. If contacted by a potential unit or if we locate a good prospect University we regularly provide recruiting and organizational support for development of the same. It's not the easiest thing in the world to recruit and develop a reenacting club for your campus and we understand that. Our officers will travel and maintain communications to ensure the success of a potential new unit and to help overcome obstacles as they grow. Interested in starting a unit at your campus? Fill out the form below and we'll contact you shortly. Are you outside of our service area? Any college based program is welcome to link up with us at large National events regardless of what state they originate from . 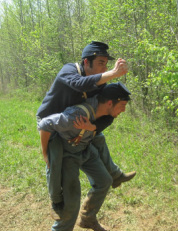 The Territorial Battalion hopes that we can inspire others to attempt similar programs in their areas and we would be excited and proud to help another Collegiate Civil War Reenacting program form in another part of the country. Interested? Please fill out the form below! Traditional Reenacting practice is to maintain a few extra sets of equipment for 3-4 people to try out the hobby before they dive in. Obviously when we're recruiting 10 -20 new faces every semester we need something far more sizable than that. Our system works around a set of "Armories" which are large storehouses of enough equipment to put 20-30 men in the field. This means that students can field for as much as a whole season with assurance that there will be gear for them to use. We do encourage participants to acquire their own gear when they move into their second year in the program but doing so at a pace that does not break their pocket book. We even arrange for payment plans and seek out good deals on used equipment to make sure our new Living Historians have the gear they need to enjoy their new hobby and serve their communities after college. However even with this type of loaner program we still never have enough equipment to meet all the demand and have even had to turn students away for the lack of it. This is a great sorrow for our program which wants to give every student interested a chance to experience their history! As we work to set up new "Armories" in more states we need to find equipment or the money to purchase it in short order. Every day more and more students show interest and stretch our already tight resources. To help resolve this issue we ask that any Civil War Reenactor in or out of the hobby consider donating any used or unwanted equipment to our program. Rest assured it will get used for the benefit of our students until it literally falls apart. In addition folks wishing to simply donate funds for equipment to the program are greatly appreciated. While most of our colleges are very happy to allocate funds for food and transport of the students, most cannot purchase equipment due to policy. Interested in donating to our program? Please fill out the form below and we will contact you shortly. 1. On an event by event basis. It's not unusual for a veteran reenactor to fall in with us when his home unit is not participating in an event we are attending. Often these are friends and even family members of the students but we also welcome just good spirited individuals that have heard of the program and want to help for a weekend. 2. By joining our current Mentor Company. The Second Colorado is our current standing Mentor Company and is a regional unit drawing members from across the region and bringing them together to provide support, training, and if nothing else an example company for the students to work with. They are always accepting new members. 3. By joining our Battalion as a Mentor Company. While the Territorial Battalion focuses on forming student units at colleges we do allow membership by traditional reenacting organizations who desire to join in the training of these great young people. We do ask that member companies participate in at least 2 events a year with the Battalion and maintain a regular team of officers with which we can communicate. While we would prefer that member companies only affiliate with our program we can be accommodating to units that have other affiliations as long as they meet the 2 event requirement and field at least 16-20 rifles when they do. As each unit is different all requests to join the Battalion are on a case by case basis. Currently we are looking for Infantry, Artillery, and Medical Units but others may contact us with their interest. Would you or your unit like to Mentor our students? Please fill out the form below and we will contact you shortly.